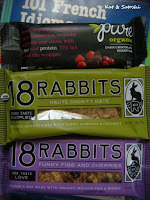 Pure Bar's Dark Chocolate Berry Bar, liked the chewiness and chocolati-ness of this. 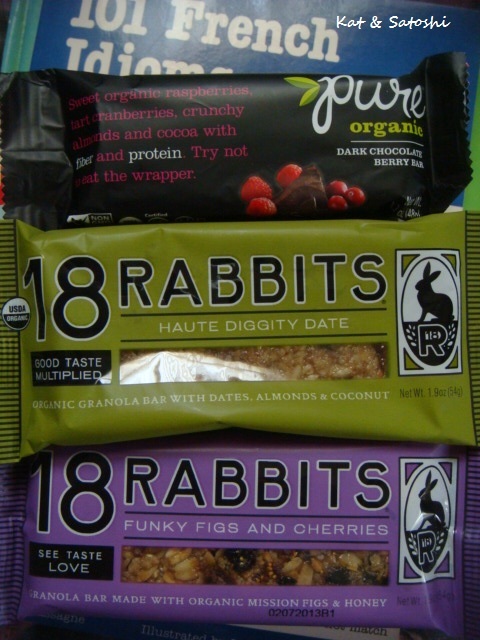 18 Rabbits' Haute Diggity Date & Funky Fig & Cherries, both were delish! 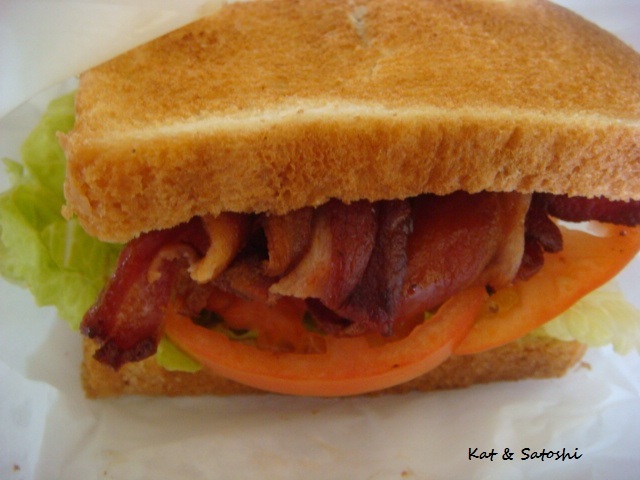 Kristen's (in Waipahu) BLT...so much bacon...love! 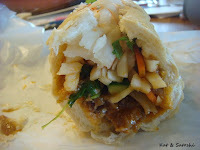 Nanding's lup cheong roll...so good! 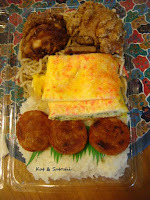 Chun Wah Kam's mini plate lunch...can feed several people actually. 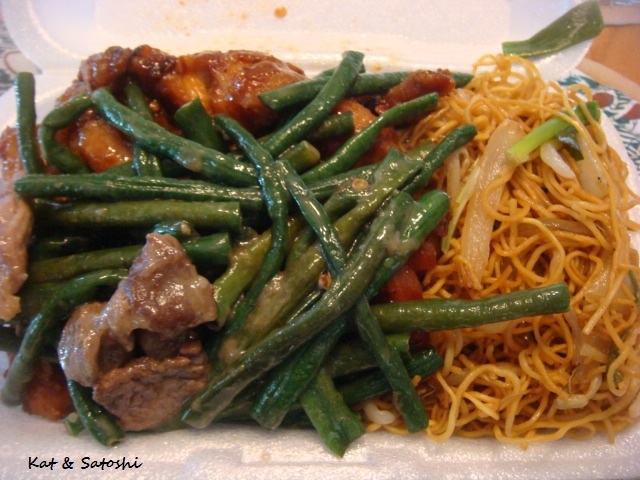 Fried noodles, spicy minute chicken and long beans with beef...yum! Ba-le's lemongrass chicken sandwich...now THAT's a sandwich! 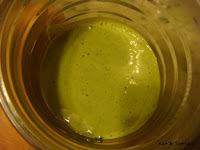 Green smoothie (baby kale, baby chard, baby spinach, apple banana, blueberry yogurt and soy milk)...could've made this thinner but it was still delicious! 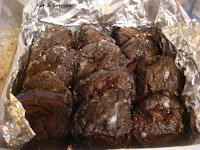 Coco Puffs from Liliha Bakery...yum! 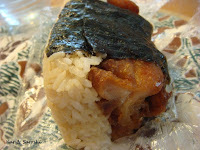 Mochiko Chicken Musubi from Tanioka's...still huge and delicious. 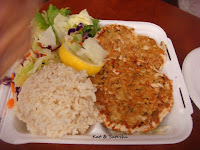 K's Bento, we've watch the price slowly go up and when we recently had them, we noticed they didn't have their corned beef hash patty in there...boo! Took my mom to check out Mamaya. 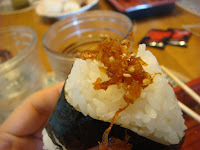 She went the "make-your-own" route and picked up some inarizushi, as well as some okazu (pre-made side dishes). 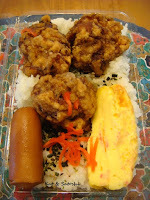 She noted that most of their seasoning is on the sweeter side, especially their tamagoyaki (rolled omelette, which is labeled "sweet egg"). 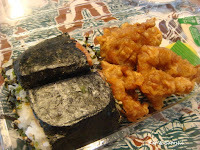 I chose the mochiko chicken snack pack...3 pieces of mochiko chicken and 1 spam musubi cut in half. Thank goodness for posts done ahead of time...some stupid copper thieves hijacked the copper wiring from our phone lines thus eliminating phone and internet service for the past day and a half! It affected 200 of us in our area. Talk about not having a life...Thank goodness some places we had to do errands at had free wifi, so that I could at least check my email. Got to meet up with Val & Greg the other day for lunch. 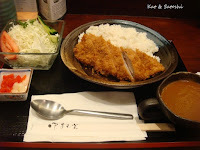 We went to Tonkatsu Ginza Bairin...the last time I ate here was in 2009, with another friend. 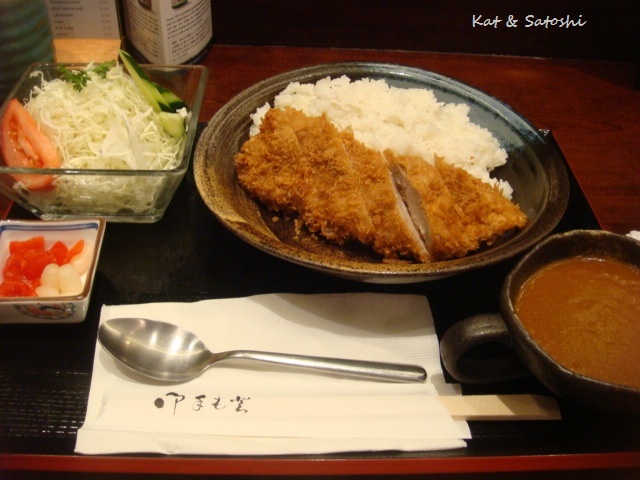 We all ordered the Katsu Curry...$15 + tax. Not sure what cut of pork it was but it was super tender and moist. The curry had the right amount of heat too. I really appreciate my friends taking time out of their busy schedules to meet up. It was great catching up with the two of them. I hope they enjoyed their lunches as well. This year the Friends of the Library Booksale runs from June 22 until June 30. I am usually in Hawaii for the tail-end of the sale, so this year, it was interesting to see what the beginning of the sale was like. Wen and I went about an hour into the sale and people were already walking out with boxes of books! 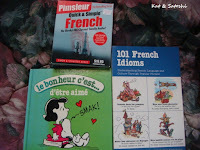 I wanted to find easy books in French, but their French section was kind of sparse this year. 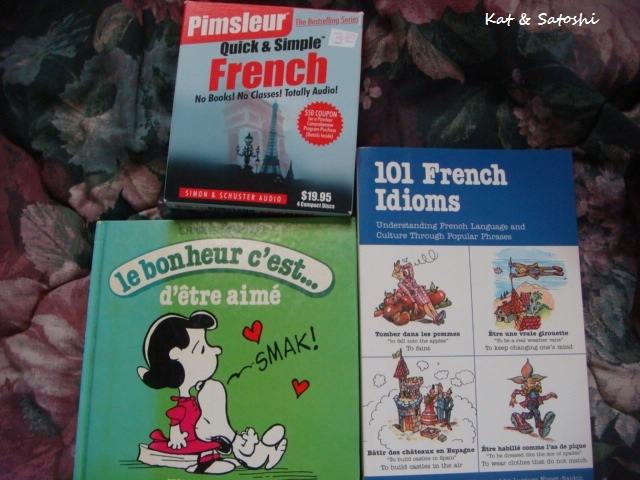 Still, I got these this year: "Happiness is a Warm Puppy", "French Idioms" & a 4-CD set for "Pimsleur's Quick & Simple"...total with tax $5.03...whoo! If you have a chance to check out the sale, I encourage you to do so. It is a money-making for our public library system. 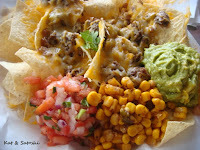 Always looking for a way to get my Mexican fix whenever I come back to Hawaii, I heard about Verde in Kaimuki. Apparently they opened earlier this year and were recently featured on a foodie segment on the news. The meat was so moist and tender and I was pleased that there were actual "chunks" of meat. From the photo, it may look skimpy but it was very filling. Everything was fresh and delicious. I also enjoyed their free lemon & lime water (which is on the counter), refreshing! They open really early in the mornings and serve breakfast & lunch/dinner all day. Met up with blog friend, Genki Tummy. She recently moved back to Hawaii and wondered if I would be interested in meeting up. We met at Mamaya, I think this shop recently opened in the Pearl Kai Shopping Center. 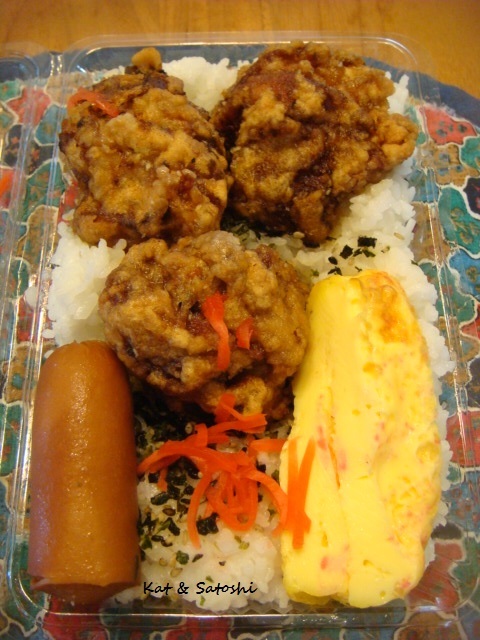 It is an okazuya/sozaiya type place which you can purchase pre-made bento or "make your own". Similar to Japan, The "make your own" is weighed after you fill up your container of choice. But, is $7.75 per pound, so if you think your eyes may be bigger than your stomach, I would suggest going the pre-made route. Genki and I had their mini poke bowls...each $5.75 + tax (this is something that Japan should start serving!). 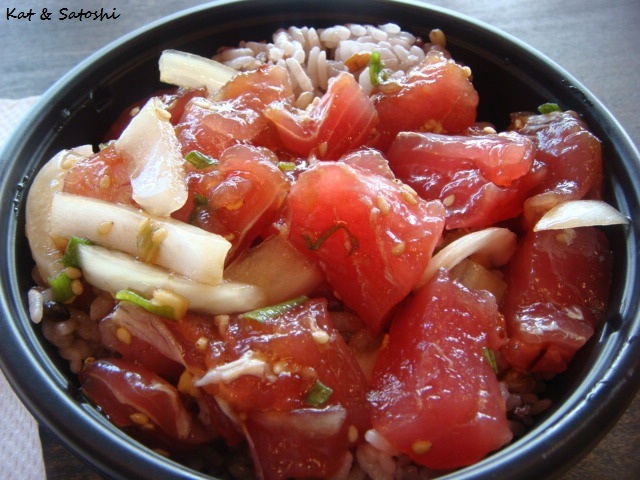 She had the spicy ahi (yellow fin tuna) while I had the shoyu ahi (they also have an oyster sauce ahi poke). I thought these mini bowls were the perfect serving size, though Satoshi would probably disagree. Genki was kind enough to share with us some Passion Fruit Jelly and Nisshodo mochi. Besides sweet bean paste, did you know that Nisshodo has fillings like coconut & peanut butter? I didn't...so yummy! 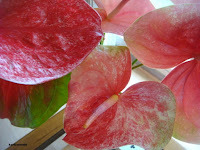 It was so nice to put a face to the blog, and I hope she had a nice time too. 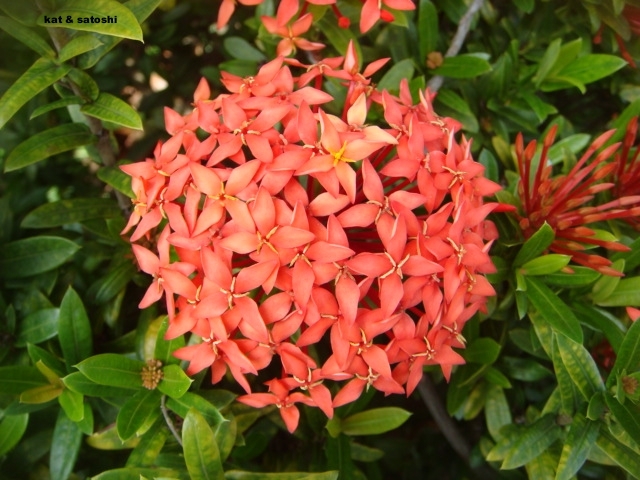 They have so many variations, it was hard to choose from. 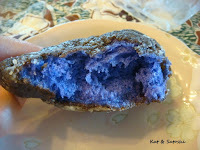 I tried their "Kalakoa" which means an assortment of colors in Hawaiian. 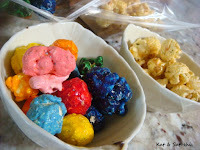 This popcorn was a bit too sweet for my liking, but it was interesting trying to figure out what flavor each color was. I also tried the Aunty Leo's Chex Mix. 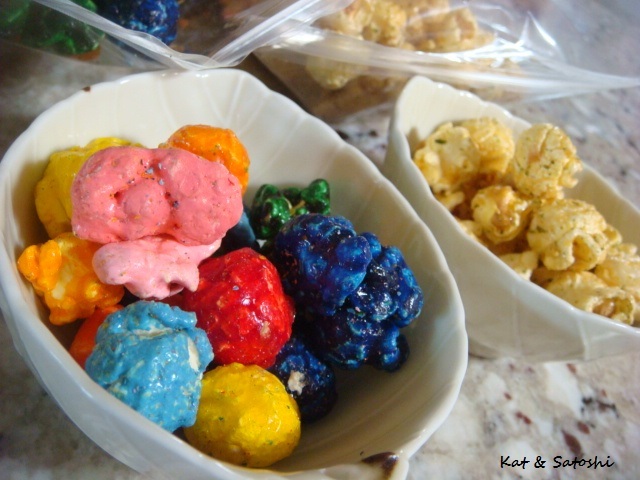 They have the standard cereals and a little furikake which is usually found in the chex mix in Hawaii. 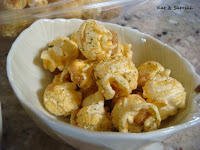 What makes their version different is that they add popcorn and then the whole thing is caramelized. The sweet and salty is pretty addicting. 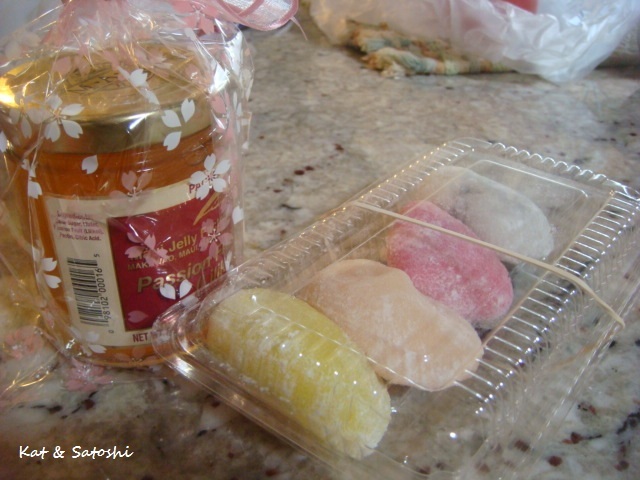 They are kind of pricey as everyday "snackage", so I'll be back whenever I need gifts. Here's to my Mom and Dad celebrating their 50th today. 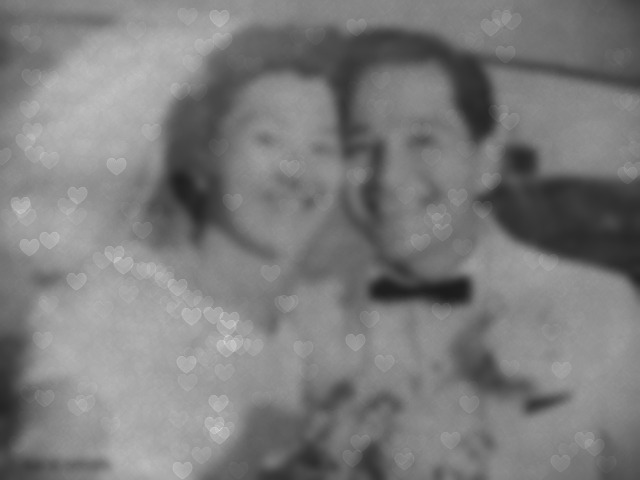 Thanks for bringing me into this world and shaping me into who I am today. 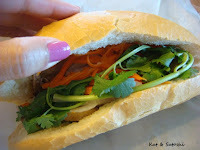 A Vietnamese sandwich shop opened recently in Waimalu called Hi Sandwich. (Not sure if it meant "hi" like "hi there" or the abbreviation for "Hawaii"). They also serve bubble drinks and smoothies. 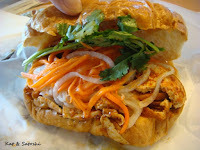 Mom tried their lemongrass tofu sandwich on croissant...meh, she though it was too spicy and didn't have much lemongrass flavor. I think the burning of incense in the shop kinda turned her off too. I tried their BBQ chicken sandwich on french bread. I gave some of this to my mom since she wasn't eating her sandwich, the BBQ chicken was mild, like a grilled teriyaki chicken, except drier. 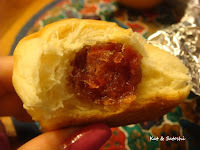 The bread was crumbly, definitely not good french bread. Unfortunately, they are related to Pho Five-O, which we've tried in the past and liked. For about $6 + tax for each sandwich, I think you could get better quality sandwiches elsewhere...I think we'll pass on going back to this place. It had been about 6 years since the last time I visited Nico's at Pier 38. Since then, I think this area had a major overhaul. The restaurant had a nice face lift and a fish market is now next door. There is also lots of free parking in a lot at the front. 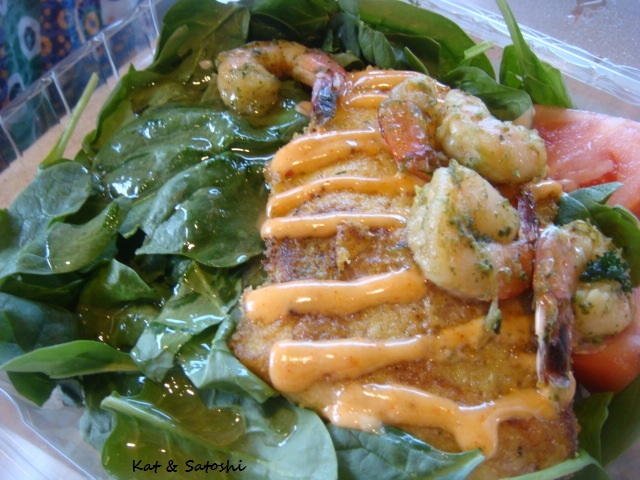 Aunty Marian had their daily salad which was a fried monchong (pomfret) with garlic pesto shrimp on a bed of spinach which she enjoyed. 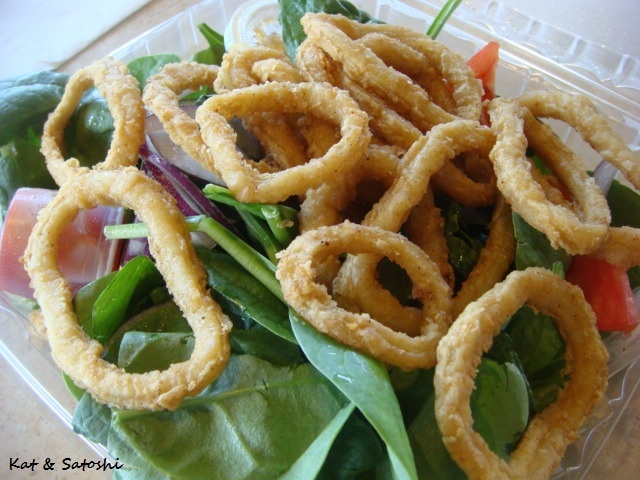 I had their fried calamari salad. I liked this but wished the sweet chili sauce/dressing would've coated the spinach better. 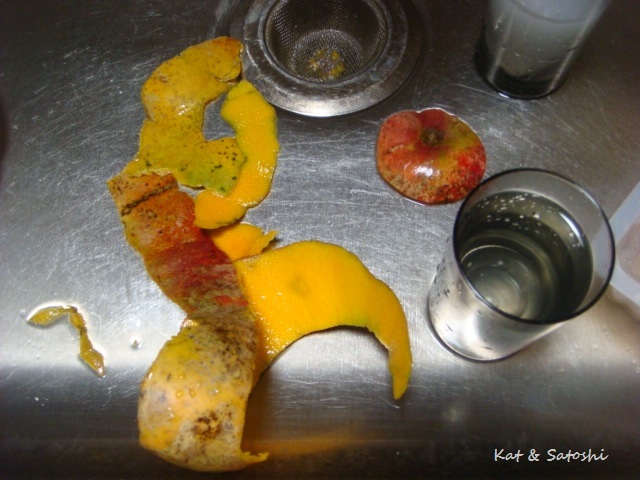 Most bites were "dry" having no dressing at all. Other than that, it was nice to have lunch with Aunty and her friend. Thanks Aunty. I picked up lunch from Blue Tree Cafe the other day. They are located on the ground floor of the Pacifica, a huge high rise in the Kakaako area. Parking is kinda sparse, but I appreciated that they validate. 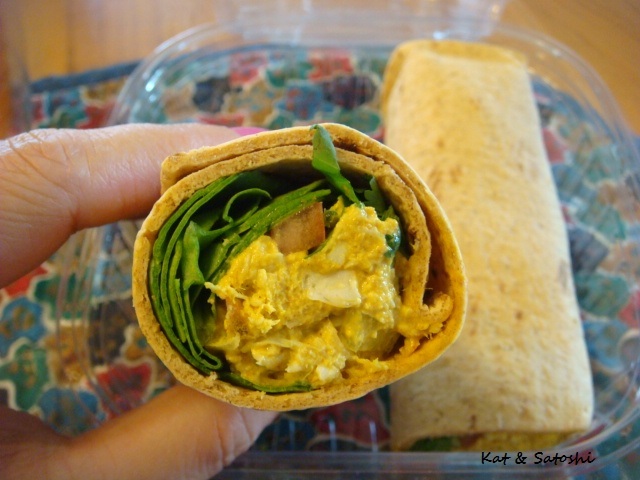 I tried their Curry Chicken Wrap...$6.75 + tax...The cumin flavor was strong, and I like that there was lots of spinach in it. I would definitely want to go back to hang out (even if like I said, their parking is sparse). You gotta love the name of this place...Taste Tea. Met my friend, Gaye and it was our first time here. 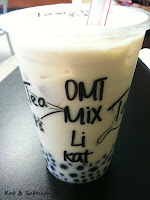 Choose your tea, they have all sorts of variations...I went with the medium sized Milk Oolong Tea. Do you want tapioca in it? Big? Mini? Both?...I chose both. Then pay...after paying they give you a little sample of your drink to make sure that is how sweet you want it to be. It was a great place to sit and chat, though the parking is shared with a used car lot, which doesn't give it a great atmosphere. Still, I'll be back...Thanks Gaye! 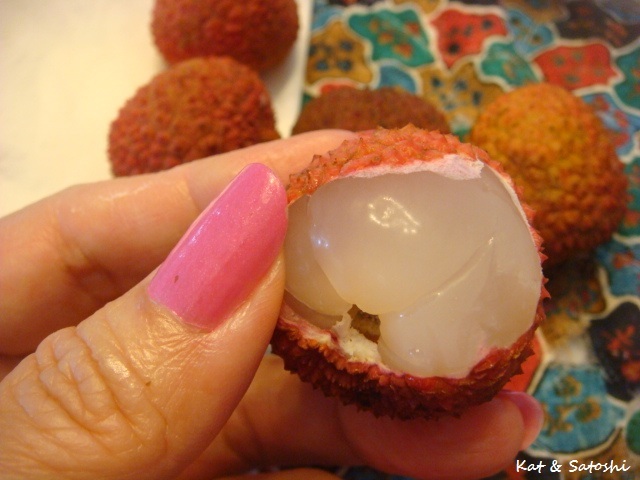 We recently received a bag of lychee from our "aunty". She received some from her friend and shared some with us. The seeds were mostly small though some were huge! We've been having weird weather here, rain some days, sun on other days, somedays a little of both. My mom recently received a taro plant and I like how after a passing shower the beads of water just stay on the taro leaf. The beads remind me of that marblecam app, only it's the real deal...cool! Grateful for all the "dads" in my life. Mom and I recently checked out Mitsu-ken's new location...yup, they moved from that teeny shop and into another teeny shop, BUT now with lots of parking. 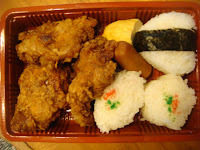 Mom went with their fried saimin bento...$6.25 + tax...not much "stuff" in their fried saimin, so she wasn't too impressed with that, but their garlic chicken pieces were huge. 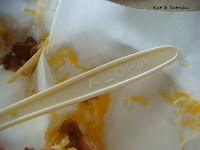 Big improvement with their parking, their lines are still quite long and their food is still delicious...we'll be back. 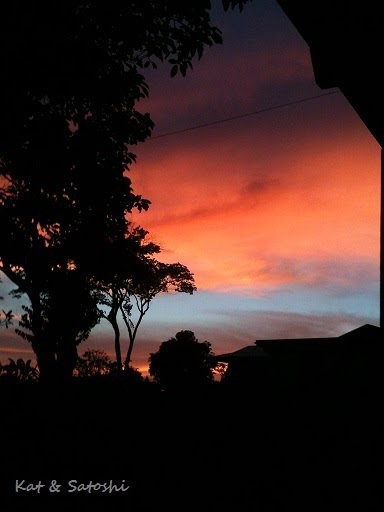 Awesome sunset the other night...the colors reminded me of shave ice. There were many festivals over the past weekend. 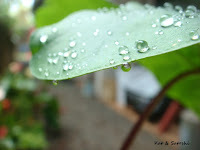 Luckily the weather was cooperative. 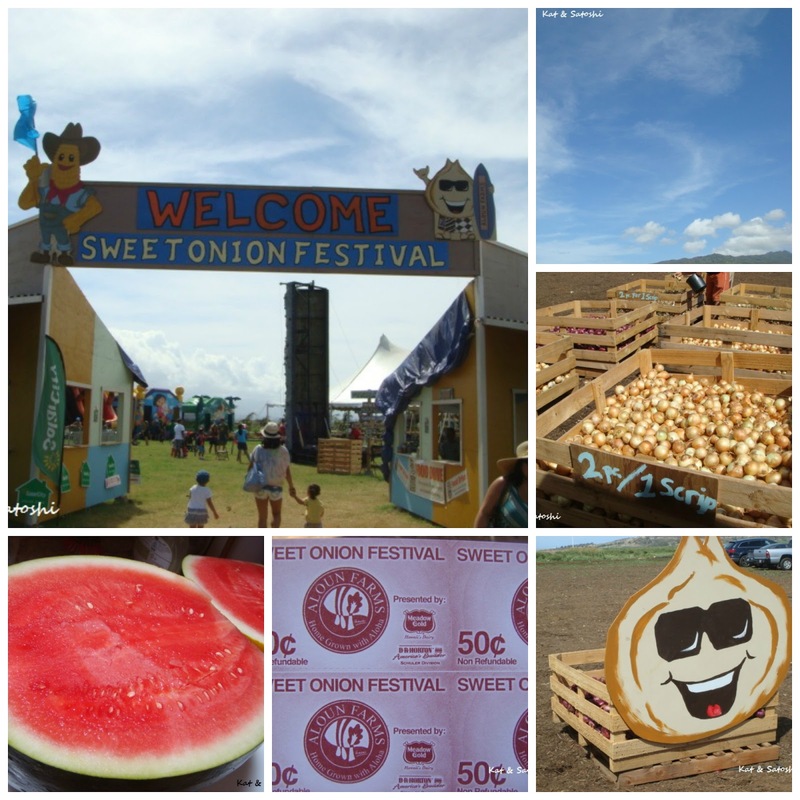 We started out at the Sweet Onion Festival. 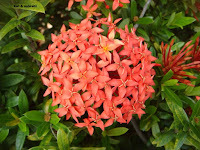 This was on the grounds of the Aloun Farms. $2 per adult to enter and then everything had to be paid for in scrips (50-cents per scrip). 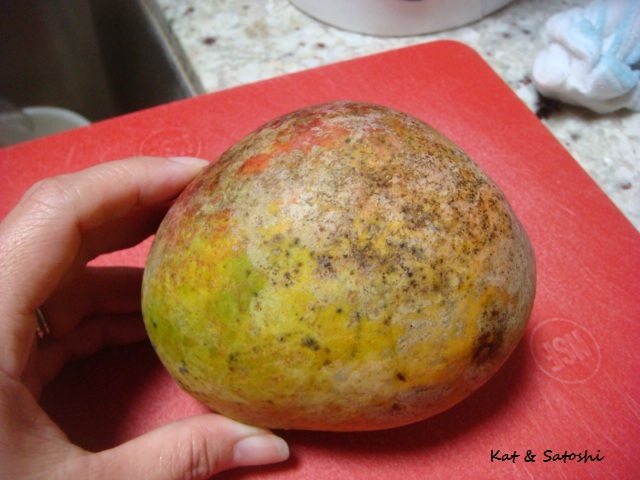 For $32 in scrips, we picked up a seedless Thai watermelon, canteloupe, honeydew melon, dozen corn, green beans, (5) sweet potato (purple kind) and lots of onions (40 to be exact)! We shared a lot of these fruits and veggies with Mom's friends. Afterwards, we checked out the Portuguese Festa. 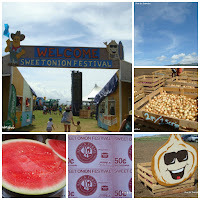 It was small in comparison to the Sweet Onion Festival. 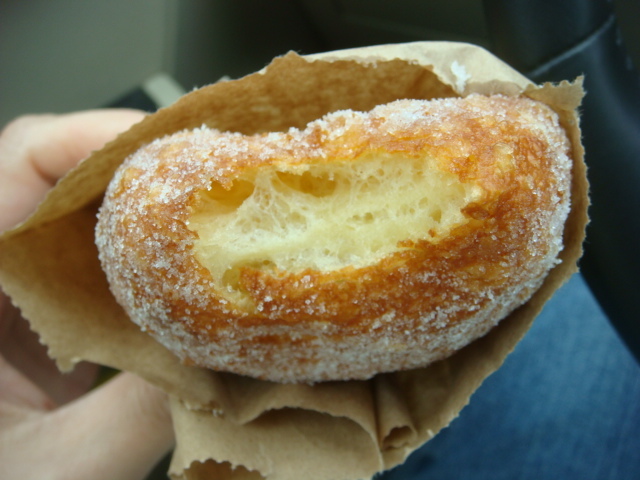 My brother had a Vinha D'Alhos (pickled pork) sandwich and I picked up some malasadas. The malasadas were fluffy and kept their shape even after they were cool. I would say they are 2nd to Champions (which is saying a lot). 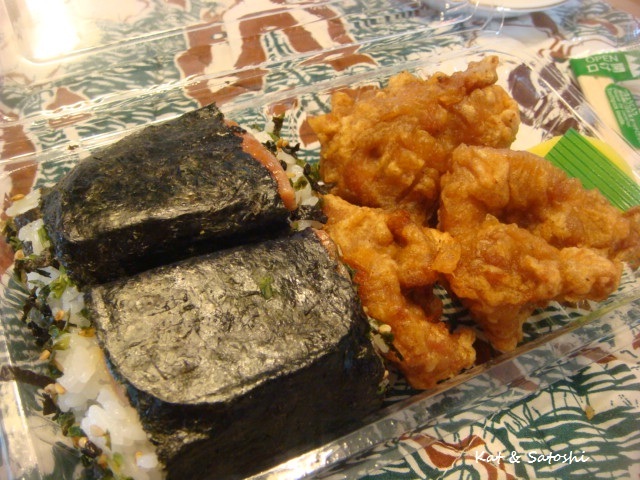 Before heading home, we picked up lunch from Leeward Drive-Inn. It was my first time ordering from this place, even though they've been around since 1964 (it says so on their sign). 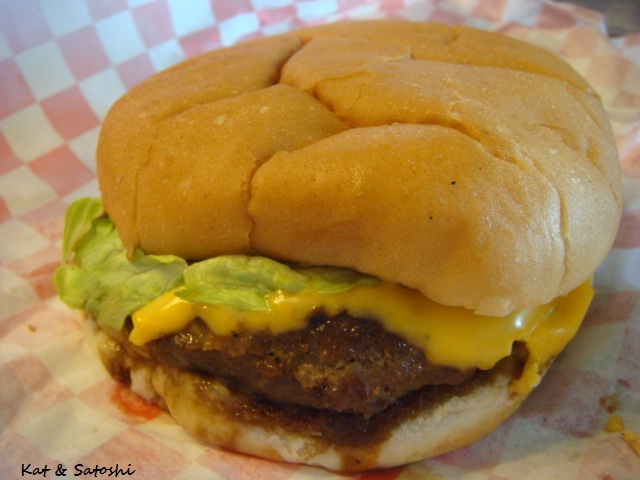 I ordered their BBQ hamburger with cheese...this was a quarter pound and I enjoyed the teriyaki sauce that was on the burger. I thought it was a nice balance of sweet and salty. 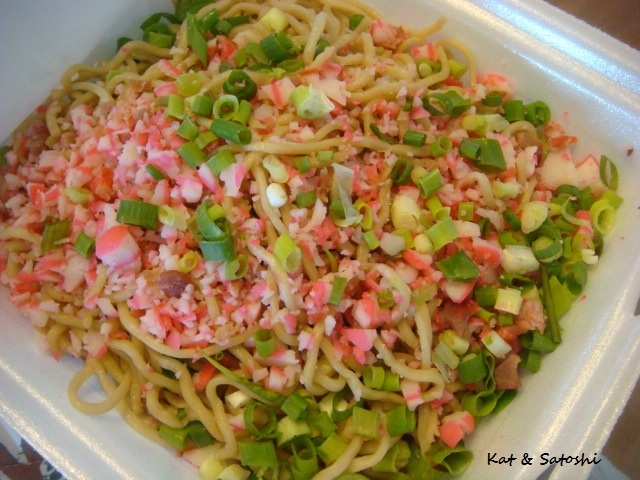 Mom had their fried noodles. I think she enjoyed this one even though their portion is massive and she only ate a fourth of it. All in all, great weather and lots of good food. 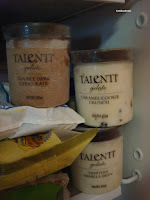 Social media is great, not only to "socialize", but to also find out what's trending...like Talenti's Gelato. You wouldn't believe how many of my friends on Twitter and FB were talking about this stuff. So, when I saw it on-sale at Safeway, I convinced my mom "we should try it". 3 pints (Caramel Cookie Crunch, Double Dark Chocolate and Tahitian Vanilla Bean), in 3 days. Delish! And, it is Made in the USA...whoo! Met up with my Flickr friend, Rex, the other day. 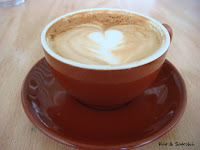 He works in town, so I asked him to meet me at R & D, which reader, Moodie Foodie, had told me about. It was a great place to meet up, "talk story" (chat), and to have a nice cup of coffee (I had a cappuccino). Thanks Rex! 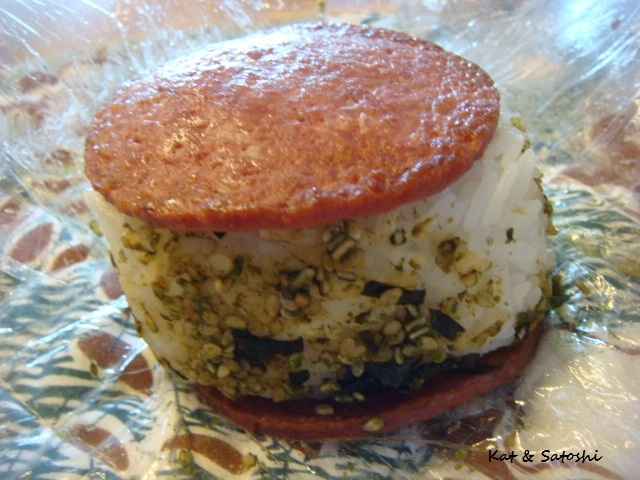 and Thanks Moodie Foodie! Around the corner from R & D is The Whole Ox Deli. I had heard great things about the place as well as seen delicious photos of their food on the blogosphere. 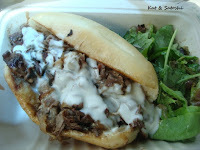 The special that day was the Philly Cheesesteak sandwich...$12 + tax. This was so good. The cheese was creamy like a white sauce, there was lots of mushrooms and onions and the beef was really tender too. The bun on the other hand was soggy, so I didn't eat it. 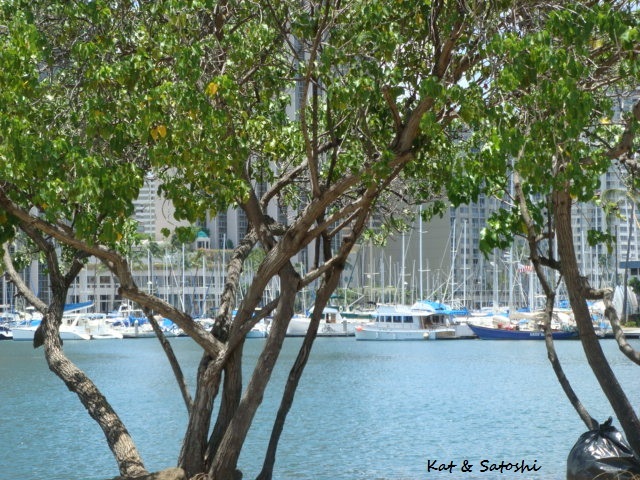 I took my lunch to eat at Magic Island...which was so nice to gaze out at the ocean. 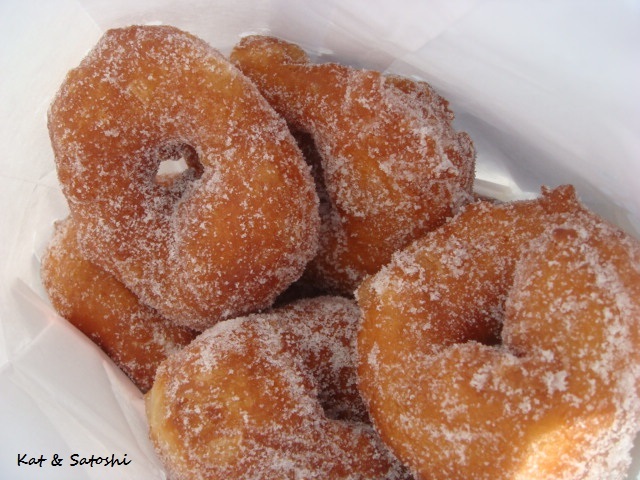 On the way home, I picked up some doughnuts for Doughnut Day. 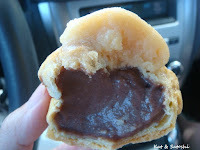 A dozen of Kamehameha Bakery's poi glazed...actually the choices everyone in my family gave me to pick up were sold out. The lady then quietly said, "I have a dozen of the poi glazed if you want though, someone ordered then cancelled it". So, poi glazed it was...delish! The previous two were double the size of this one...Thank you! Recently, we checked out Ige's 19th Puka for lunch. In Hawaii, "puka" means "hole". 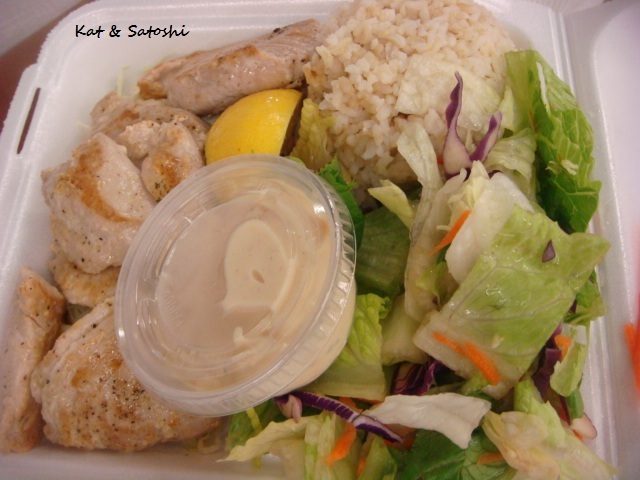 Aunty Marian went with their Fresh Seared Ahi(yellow fin tuna)...$12 + tax. This was grilled with lemon butter and served with a cilantro aioli. This was good except we thought that the aioli could've used more cilantro. I tried their Furikake Ahi...$12 + tax. This came with a spicy oyster sauce. The sauce was thick, spicy perfect for the ahi. Mom and Grandma shared the Fish Tofu Patties...$10 + tax. This came with a sweet chili aioli which had no spiciness to it at all. 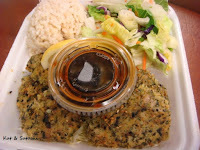 Also the patties which were HUGE had more fish than tofu. They said these were delicious, but if no one had told them there was tofu in it they would've thought it was just a fish patty. Lots of seating and everything comes out pretty quickly.